This new sale will be the e-commerce giant first big sale after the Walmart acquisition was announced which will give the Americal retail giant a 77 per cent share in the Indian company. 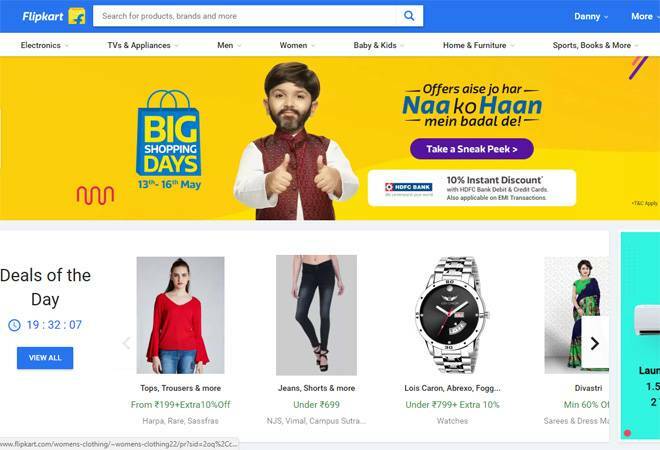 Flipkart announced that Big Shopping Days sale will begin on May 13 and will go on till May 16. The four-day Flipkart sale will offer huge discounts on smartphones, tablets, laptops and other gadgets along with clothing, accessories, home decor etc. This new sale will be the e-commerce giant first big sale after the Walmart acquisition was announced which will give the Americal retail giant a 77 per cent share in the Indian company. In future, we can expect both Amazon and Flipkart to go head to head and eventually better sales from both brands. Amazon will also be conducting it's Summer Sale during the same period as Flipkart's Big Shopping Sale. Coming back to the offers, Flipkart has shared various price cuts and discounts with the highlight being the Google Pixel 2 and Google Pixel 2 XL. These will see massive price drops of up to Rs 15,000. Flipkart has partnered with HDFC Bank and will give customers a 10 per cent discount on credit and debit card transactions, including EMI transactions. The sale will include up to Rs 37,000 discount on gaming laptops while headphone accessories will see a discount of up to 75 per cent. Power banks will see a significant drop in prices as they will be available for as low as Rs 499 while Google Chromecast, the iPad Pro 64 GB will also witness a dip in prices. The sale period will also feature the launch of smartphones and the purchases will be Flipkart-exclusive. The Honor 10 is one of the devices launching during the sale days, the device will go on sale on May 15 on Flipkart. All electronic products will offer No Cost EMI, Buyback guarantee and extended warranty. Blaunpunkt Wireless Dolby Soundbars will be made available from Rs 9,999 (originally Rs 24,990) while Xbox, PS4 and wearables like Apple Watch Series 3, Misfit Vapor and the Mi Band 2 will also see great price drops. The four-day sale period will see discounts in clothing, footwear, household appliances, TVs, furniture and home decor as well. This time around, Flipkart has introduced a Game Corner, where customers can play and win laptops, mobiles etc. for just Re 1. They will also get the chance to get 100 per cent cashback during the mega sale. The e-commerce brand is expecting to see a boost in sales, six times more than the average during the four days, especially in the mobiles and large appliances category. The Big Shopping Days is an opportunity for the e-tailer to boost up its sale in all departments. At a time when almost all e-commerce companies are neck to neck to enhance their customer engagement, Flipkart will look to do the same. The company has also promised something big for Apple iPhone fans during the Big Shopping Days Sale. Stay tuned to Business Today's website to get all the details on the best deals from both Flipkart and Amazon sales.